“Lest the old traditions fail.” This is a catchphrase from the alma mater that Dartmouth students hear in several different contexts. In many ways, it exemplifies the nature of Ivy League prestige: when we speak fondly of tradition, it usually has to do with a harkening back to the “golden age” with a tinge of sentimentality. Traditional Dartmouth songs, besides the alma mater and “Twilight Song,” aren’t very well known among students, so this might be difficult to put in perspective. Of course, this applies mostly to current students — they are still meaningful to many alumni who sing them at reunions. Even among current students, there are exceptions: student performance groups like the Dartmouth College Glee Club, the Dartmouth College Wind Ensemble and various a cappella groups perform traditionals. According to Max Culpepper ’53, former director of the wind ensemble and the Dartmouth College Marching Band, most of these traditional school songs were written at the end of the 19th century or the beginning of the 20th century. Naturally, they tend to reflect the lifestyle of Dartmouth students at the time, who were all men. For this reason, many of the songs have to do with brotherly bonding, sports, school spirit and drinking. Most of the songs reflect a very positive attitude about the experience of male students at the College. They are high-spirited, sometimes with totally irreverent lyrics. Others are a bit more serious, looking back on the past with a sentimental light. The alma mater, for example, is a good tune, according to Culpepper, because it’s easy to sing, sounds good both sung and performed by a band and has meaningful lyrics. This is why, he said, it stuck throughout the years despite some challenges. For example, during the inclusivity debate that arose after the introduction of coeducation, the song was so well-liked, it persisted despite the controversy — instead of abandoning the piece, “daughters” was added despite its lyrical and musical complication. Today, the football team still sings it on the field after their home games. The traditional songs’ initial success and the strong sense of nostalgia conveyed has much to do with writing in the style of the time, according to the glee club’s director Louis Burkot. The traditionals were written at the time that romantic music was traditionally strong, especially as influenced by the classical tradition. For those unfamiliar with classical music, think large-scale, harmonically rich pieces, often incidental music composed with dramatic stories in mind. According to both Burkot and Culpepper, the era of writing traditional songs has fallen out of fashion and probably will not return again. The reason they’re traditional, after all, is because they’re old, and it’s not necessarily a bad thing that students no longer feel the same way about the songs as they did before, Culpepper said. It’s difficult to imagine a student of today writing in that style of familiar, somewhat cheesy poetic language, much less setting the work to music. Burkot noted that when the wind ensemble performs on tour, audience members always chuckle at the line about the “granite of New Hampshire,” for example. Burkot said there might be a possibility that the traditional songs might come back into fashion, but only if they were written in a different and more modern style. He suggested something like a Dartmouth rap or a “Hamilton-esque” song would make the students of today feel like they want to sing it over and over again the same way the students of Old Dartmouth did. Now, it is only in the context of intentional nostalgic sentimentality that the students sing the songs — situations of elevated emotions like the annual Homecoming ceremonies, Burkot said. Singing them in those contexts, students feel them deeply, but this only happens in specific moments in which the school is trying to create a sense of fellowship and friendship among students, faculty, alumni and administration. Burkot believes this is partly attributed to the fact that students are “busier and busier than they’ve ever been” due to the increasing demands of the world, as rising expectations that they are expected to fulfill as world leaders prohibit students from finding time to relax and relish the broader college experience. Culpepper noticed a similar change, saying, “our student body has a different attitude, probably a more professional and maybe more serious attitude” than in years past. Culpepper also attributes the decline in interest of the songs to a decline in interest in football. In 1985, Culpepper’s first year of teaching, the marching band had a whopping 120 members. Both the section in the bleachers where the band sat and the section where the freshmen sat overflowed with students, he said. As football became less and less important to students over the years, however, the attendance at the games markedly diminished, he said. Another characteristic typical of many traditional Dartmouth songs that has resulted in the decline of their popularity is their political incorrectness. During the coeducation debate regarding the alma mater, some male alumni objected to hearing the tune being sung in the soprano voice alone. Therefore, the melody was split between the voice parts — ”Dear old Dartmouth, give a rouse!” was sung by the women, and “for the College on the hill” was sung in an abruptly deeper, melodically disjunct manner by the men. In order to accommodate that, the arranger made the other vocal parts sing the melody very thickly, and as a result, the arrangement became cumbersome. It was only later that a student, Zach Vaughan ’05, insisted on arranging a version with the melody in the soprano line that became the version we know today. Interestingly, women initially barely voiced their concern about the alma mater being changed, and those who voiced their concern predominately voted against including women in it. 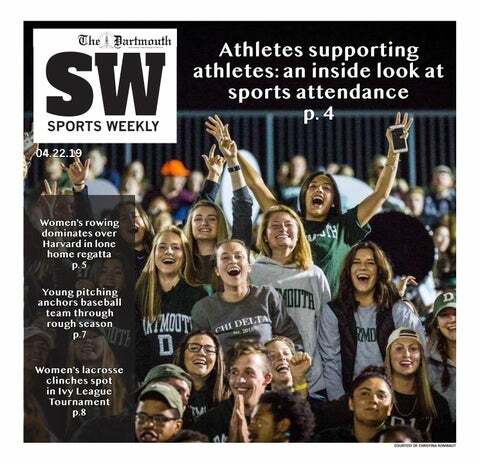 Other songs, like the “Twilight Song,” were changed to include the female students of Dartmouth. In the lines that only included “brothers,” students spontaneously began to sing “sisters” with it as well. It was musically bizarre because the change added two syllables to a refrain of verse in iambic pentameter. But this awkwardness may have served its own purpose — it was “sung in a defiant way,” Burkot said. The next time printed arrangements came out, they included “sisters” in print. Other songs have fallen out of favor completely and are generally no longer sung. Burkot cited one change that he agreed wholeheartedly with: the school’s derecognition of the song “Eleazar Wheelock,” the song that adorns the walls of the “Hovey murals,” a controversial depiction of early Native American life and colonization. Some alumni, Burkot said, hoped the glee club would sing it again. He also speculated that that some alumni probably sing that song in the privacy of their own reunions. However, alumni during glee club alumni reunions only sing the official songs. Despite a complicated history that is still unfolding, the traditional songs in context reflect a humanistic truth about Dartmouth: the continual change in how generations develop, maintain and express their perspective on our traditions. During reunions and Commencement, the different generations sing the version of the alma mater that they know, resulting in a temporary dissonance until everyone syncs up again. At Commencement in a few weeks, the graduating class, alumni, visitors, relatives and faculty might all sing differently. And in the future, Burkot said, there will probably more versions down the line.